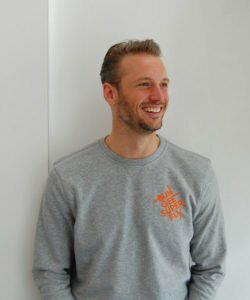 Sjoerd has been a Bungee Super Fly teacher for just over a year but his enthusiasm for movement and physical challenge started before he took part in the teacher training. In the past he has been a commercial dancer working together with many Dutch artists on events and TV shows. Now, he also teaches Bungee workouts to students weekly and enjoys that every day is different. Sjoerd, Bungee Super Fly teacher. What convinced you to become a teacher of Bungee Super Fly? When I saw that Janneke, the founder of Bungee Super Fly, was looking for more teachers I looked into what she does. My first thought was: “Wow, that looks really cool!” It felt like a chance to discover a completely new way of physical movement and teaching. It got me immediately enthusiastic. I have been a dance teacher and this was a completely new thing and style of movement. How do you come up with the new movements for a lesson? Well, that’s the fun part. 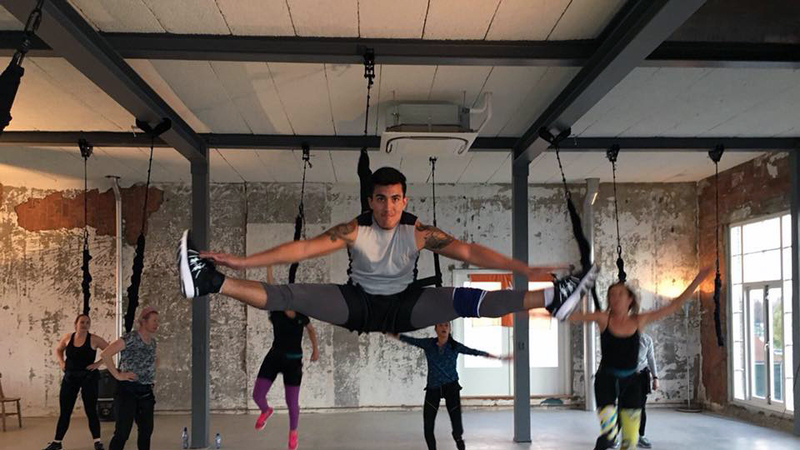 There are of course a set of movements all Bungee Super Fly teachers learn during the training however, since it is so new, there are many new moves to discover. Sometimes, while I am teaching, one of the students will surprise me with a completely new move and I will add that to the collection. We also give different names to the new moves and discuss between teachers what they are. For me, that’s what keeps it interesting; being challenged, creating new moves and having fun. What has been the most challenging as a Bungee Super Fly teacher? In the beginning it was finding the right build-up and trying not to do too much. It is a lot of fun so I wanted to show the students as much as I could. However, sometimes that can be too much as for a complete beginner a few new moves already gives them a great experience. Now, I let them have the time and I also adapt more to their needs. Can you tell a bit more about the teacher training? The teacher training really brings together all the important elements of a Bungee Super Fly lesson. You get the theory behind it, like the anatomy of the body, but you also get the right structure of classes, equipment knowledge and practical experience. You can also practise the new movements on the other teachers taking part in the training. Janneke really takes her time to explain everything behind a movement or step, so that you know what to expect and understand. Is Janneke the teacher during the teacher training? Yes, and she does that with a lot of enthusiasm and care. She has years of experience but also knows how to a create a great atmosphere for the training itself. This is important as you can sometimes have about 10 teachers in a training for 4 days, so it’s good to feel comfortable quickly and start practising on each other. If you look at your students, what are they usually looking for in a Bungee class? The people who come in have usually seen it somewhere or heard it from somebody. Most of them become quite shy and careful as they don’t know what to expect. As a teacher I really aim to help them break out of that and go into the movements. Once they are confident, they can really enjoy. The best feeling is when I see the difference in the students when they enter the class and the joy on their faces when they leave, that’s what I do it for. It’s really satisfying to hear them say they had loads of fun, sweated and had a great workout. How many students do you teach now that you are a teacher? Now it’s about 3 to 6 workshops a month. I usually prefer to give classes to a group of 10 to 15 students because it is so new for them, keeps it personal and safe. We also advise strongly to other teachers of keeping to maximum 15 students unless they have an assistant. For larger events, special occasions and festivals we have also done the class with more students at the same time but then we also had a team of teachers to make sure every one enjoyed it. What advice would you give new Bungee Super Fly teachers? Take your time to prepare. Enthusiasm is good because it is a lot of fun but take your time to try out different styles and movements. This is best done with other teachers so you can get feedback immediately. And even more important, let students have fun and even forget about the fact that they are sweating and working out. They will remember that the next day when they have some muscles cramps..